Happy 2nd Anniversary, Colors TCG! As of today, Colors TCG has officially been open for 2 years. 1 day left - getting so close! During the voting for Akai-san's design, one conversation about the possibility of writing fiction about the characters spawned the idea of the Colors Universe. That was the first time the phrase had been used. I had thought it would be difficult to hold 8 contests to fill up the universe with our eight characters, but we not only had 8 contests, we even had a 9th one for Kurocchi and Shirocchi. We had many artists participate, and a total of 7 different artists winning the contests. Thank you for making it happen, everyone! I am so in love with all the characters! It just goes to show that some things, like the existence of the Colors Universe, weren't planned from the beginning. It's thanks to people's suggestions that the Colors Universe and many other TCG ideas came to be! Another tidbit: The birthdays of the characters are the days voting ended for each contest. Only 3 days left until the Colors Anniversary! Extra pieces of trivia: The series with the most number of decks (33) has been Hetalia for over a year but there are two series really close to overtaking it at 32 decks. These series are Katekyo Hitman Reborn and Pokemon. There are 132 series with only one character deck and 84 with only two. Have you participated in Colors League last year? It was an event that started out as some randomly tossed ideas between some mods and players, but once Lucathia gave her approval, it became real! Players were divided into teams and worked together to earn points by answering League games and completing extra tasks! You can view the stats as well as the teams' plotting hangouts under the Colors League tag at the trade comm. Last year the winner was Team Murasaki, who do you think will win next time? You heard in one of the previous Anniversary tidbits that there are 16 games up and running at the moment, right? Did you realize that in total, we have had nearly 1600 rounds posted? This post brought to you courtesy of Windows/Microsoft problems! Now that the wonderful, awful Skie has a functional computer, this post can happen. 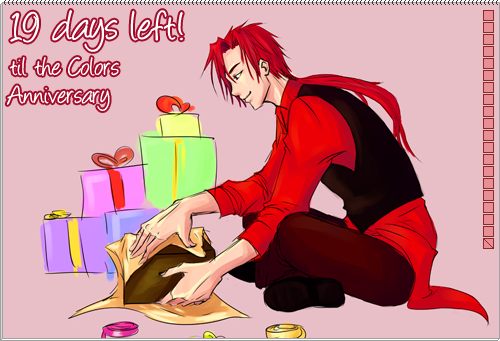 Technically now there are eight days remaining; but hey-- enjoy this post anyway! Colors is the cumulative work of a number of different people. The original idea and many others came directly from Lucathia itself, but others have contributed to the growth and expansion of the TCG as a whole. Big things, little things, everyone contributes in their own way to make Colors what it is today. That's right, guys. It wouldn't be what it is without you. All of the sketchpads and level banners? That's all of your hard work for everyone to use. Some of the games, too, are ideas proposed by the players themselves; turned into a reality. Even some abstract player-led ideas like The Asobot Initiative have become an actual part of Colors. So don't be afraid to step up and make something. If it's awesome, you might see it become a part of the community as we continue on. Make tomorrow a brighter day! Quiz: Hey, did you guys know that a player/mod made the Flowers Tier icons? Any of you could be the one to make the icons for the fifth tier! 8 days left - back to the roots! This post is brought to you by scheduled posts. Lucathia should currently be at Fanime at the time of this post. XD; If this posts before 9 days left, oops. If anything needs editing, Lucathia will fix it when she's home! The idea for Colors was born while Lucathia was writing her masters. She wanted to procrastinate so much that she made a post in her LJ on April 28, 2010 hoping people would persuade her out of the idea. Instead, she made card templates and immediately set up a site on April 29, 2010, merely one day later. The LJ community colors_tcg followed after that and was created on April 30, 2010. Enablers included Kuri, Lucius, Kaze, Laxis, Eri, Chikky, disutansu, Asuka, and many more who chimed in with that very first post (Guys, you were supposed to persuade me out of this!!). And then Colors opened for prejoin merely 13 days after the community was set up... that sure wasn't a lot of time of prep! Hey, have you heard of Colors RPG? It's a game created by darkraven616 in RPG Maker. It features an awesome group of heroes embarking on adventure to save the Colors Land. Give it a try if you haven't already! 11 Days Left until the Colors Anniversary! Colors had 16 games when it first opened. And though most have changes mods, changed formats, and some had a few moment of hiatus, all of them are still going strong to this day nearly 2 years later. Which is a testament to our amazing mod team, both past and present, for being able to keep the games feeling new and exciting. When we were still in prejoin mode, there were only 36 members, but through recommendations and pimping to friends, we've managed to grow so much! The official number is 188 now, but that's still almost four times what we started with. Let's do our best to bring in more friends, and make this game the best ever! this fantastic artwork brought to you by nugeyo ♥! The very first Colors mastery was the Meister deck featuring Setsuna F. Seiei from Gundam00, by Tari/ ratiosu! 14 Days Left until the Colors Anniversary! Of course this would be late. I really feel like I live in the wrong timezone. If only I had another hour in my day all my posts would actually be on time. Making portfolios has been one of my longest mod duties and I always enjoy seeing what decks members put together for one portfolio. I especially enjoy the theme portfolios. The ones by series or just with characters with similar characteristics. As an extra fact anyone want to guess what color Monochrome portfolio is the most popular? 15 days left - what else are we waiting for? Mikan finds that a lot of things are cute. Even the strangest things that other people would find gross. 16 days left - let's bring out the dirt! Akai-san secretly sleeps with a stuffed teddy bear at night. This goes without saying! He also seems to have a thing for cute stuffed animals as pictured here. The only mystery remains, where did he get it from? Did he buy it on a tangent one day and hid it from everyone, not mentioning that he might be an otomen? Is there someone in this household who might have bought it for him as a present? Who knows! What do you, the community, think? 17 days left - are you tired of me yet? art is by shamuon! ♥ Thank you for the art!! 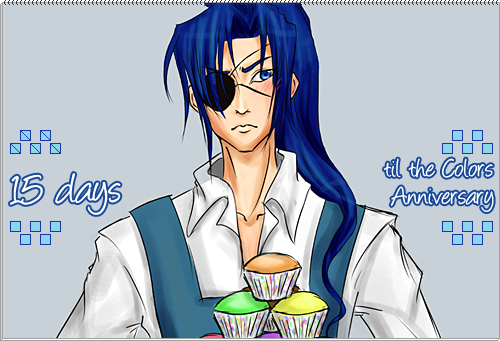 Aoi-sama has an eyepatch covering one eye. However there is no canon evidence that reveals what color his right eye really is. That is to say there has been headcanons up by a few members on what the color of his eye is, but it technically wouldn't be confirmed. Anyone has any thoughts on what color it might be? Blue? Green? Some kind of pastel tint? Or even some wacky rainbow color for all we know! The original deckmakers when the TCG started not only included Lucathia but also slashed_dream, stillarium, and vriska! 19 Days Left until the Colors Anniversary! Hello guys! This is Chuu! 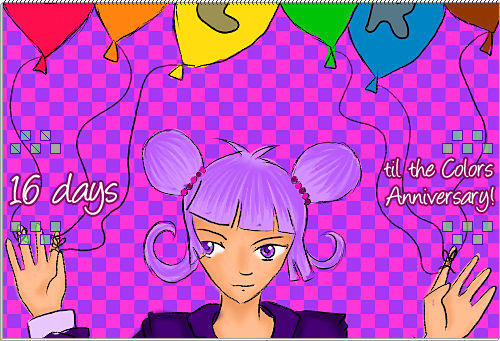 And I am here to start off with the countdown until the colors 2nd anniversary. It's almost been 2 years! How time flies. Exciting isn't it? For each day, there will be a little tidbit or fact about the colors tcg as a whole. It could be about its history, its moments, and so forth! :) Initially we were just going to spam the art day by day but I'd thought I'd add it in as a touch. Colors TCG officially opened on June 2nd, 2010. Prior to that, it had opened up for prejoin on May 13th, 2010; over 2 years! I personally wasn't there for the start of the prejoin but there were a notable amount of members that have, including our very own lucathia_rykatu!